This Sunday marks the annual World Day of Migrants and Refugees. On this day, founded by Pope St. Pius X in 1914, the Catholic Church honors the families around the world who’ve made the difficult but courageous decision to migrate abroad in search of new opportunities and a better life. But we also remember in a special way the refugees who, like the Holy Family, have been forced to flee violence and persecution. Sunday is a good day to reflect on how, in our lives as Christians, in our communities and in our church, we’re living up to the call of Jesus to welcome the strangers in our midst. And this year it’s an especially pressing question because, according to the United Nations, there are more refugees than ever. Nearly 60 million people across the globe are refugees, asylum seekers and internally displaced persons. That’s the largest number of forced migrants in history. Health care. After ISIS captured control of the Christian heartland of Iraq in the summer of 2014, some 130,000 Iraqi Christians took refugee in the Kurdistan region of northern Iraq. We’ve helped open three medical clinics and two mobile clinics to care for the displaced Christians, Yazidis and other refugees who can’t return to their homes. In 2016, we anticipate the clinics will help about 4,000 people each week. Food aid. Jordan has been a welcoming safe haven for refugees fleeing their homelands, but deep-rooted fear leads many vulnerable minority groups — including Christians — to avoid the refugee camps. This means they don’t get much-needed assistance from large international relief organizations. Instead, Christians often turn to churches for help. In Jordan, CNEWA partners with the Franciscan Missionaries of Mary to provide food tickets to refugee families, who can use them to buy food at grocery stores. The beneficiaries include both Iraqi and Syrian families. The tickets ensure they receive safe, nutritious food, while also upholding their dignity by giving them the freedom to make their own purchasing choices. More than 2,000 children currently benefit from this modest but meaningful program. Spiritual comfort. Nearly seven decades after the 1948 Arab-Israeli War, more than 5 million Palestinian refugees are still under the care of the international community. CNEWA helps Palestinians throughout the West Bank and Gaza, but we also do it in a rather unique place: a refugee camp in Lebanon that’s exclusively for Christian Palestinians. There, we support a small community of three Little Sisters of Nazareth, who are trusted friends, advisors and spiritual counselors to the 500 families of Dbayeh camp. They’re a visible and enduring sign of Christ’s presence to the poor. This year, we’re working with other Catholic and civil society organizations to call attention to the special needs of women with children in the exodus of refugees from war-torn Syria. In a world with more forced migration than ever before, it’s vitally important for the Catholic Church to be a leader in efforts to relieve the suffering of refugee families. Thanks to our supporters and collaborators, CNEWA is making a genuine contribution. On behalf of everyone here, I want to thank you for making it possible. But I also want to ask that, as you gather with friends and family this Sunday to celebrate Holy Mass, please offer a prayer for the world’s migrants and refugees. We were touched by a letter we received the other day, postmarked from Phoenix. It came from the Arizona State Department of Corrections. Who could fail to be moved by that spirit of generosity, and such a simple but profound act of faith? During this time, the holiest week of the Christian calendar, we remember in a special way all our benefactors, and all who so earnestly and faithfully seek the face of Christ. Not only do we pray for our donors, but so do the poor — and their prayers are beloved by God, who hears their cries and offer to his children his tender mercies. Thank you to all who are giving so much. Be assured of our continued gratitude and prayers — and know that every gift somehow works to uplift those most in need. May your Holy Week be a blessed one! We join our prayers today with so many others being offered for the repose of New York’s retired archbishop, Cardinal Edward Egan. Many will be gathering at St. Patrick’s Cathedral for his funeral this afternoon. Cardinal Egan was a devoted and passionate friend of Catholic Near East Welfare Association. He was proud to serve as CNEWA’s president during his tenure as archbishop. An enthusiastic supporter of our work around the world, Cardinal Egan gave selflessly of his time, his insight, his attention and his prayers as we worked to further CNEWA’s mission in the Middle East, Africa, India and so many other places in need. Long after he retired, he remained a loyal reader of our magazine, ONE, and never failed to offer his encouragement, friendship and prayers whenever and wherever it was needed. I’ll always cherish and remember fondly the personal expressions of support he offered to me on so many occasions after I joined CNEWA. As we pray for him, we hope he will continue to pray for us — and that his love and fervor will accompany us as we continue to accompany so many of our brothers and sisters who are seeking healing, consolation and hope. Eternal rest grant unto him, O Lord, and let perpetual light shine upon him. May his soul and the souls of all the faithful departed, through the mercy of God, rest in peace. Amen. Yesterday, I received a note from the apostolic nuncio to Uganda, Archbishop Michael August Blume, S.V.D., that included a twenty dollar bill. In Italian, he wrote that the children of St. Kizito Primary School in Bugolobi, a neighborhood in the capital city of Kampala, had decided to raise money for the needy children of Palestine. The twenty dollar bill, he wrote, was the fruit of this initiative of the school’s generous children. A Divine Word Missionary from South Bend, Indiana, the archbishop asked the CNEWA family to remember in prayer the intentions of these loving young donors from Africa. What a loving testimony to the needs of others! Indeed, the beautiful children of St. Kizito in Bugolobi will be remembered in our prayers, and we ask them to remember us as well. I can think of only two words to describe it: total chaos. I’m talking about the tidal wave of violence that’s sweeping across Iraq, as the extremist group called ISIS battles for control of the country. Here at Catholic Near East Welfare Association, this has us completely alarmed. It’s why I hope you’ll click here to help them. Only days ago, two sisters and three young Iraqi Christians disappeared, and it’s feared they’ve been kidnapped by militants. The extremists also shelled the city of Qaraqosh, where CNEWA supports an orphanage. And in ISIS-held areas, Christians unable to flee are now forbidden to display crosses and other religious symbols. As for the thousands of families who’ve escaped, they have no idea if their homes still exist. Many are elderly. The majority are women and children. All live in fear of what tomorrow may bring. Pope Francis has urged us to pray for these victims of violence. But they also need something else: your support. At CNEWA, we’re committed to helping scores of nuns, priests and lay workers care for these displaced innocents — Christian and non-Christian alike. But I’m afraid their overwhelming situation is growing worse. to help these terrified families. Won’t you join us? With their world turned upside down, these families have never needed you more. So please help them. All you have to do is click here today. How Can We Help to Grow Peace? This past Pentecost Sunday, I was profoundly moved by the historic prayer summit our Holy Father hosted in the Vatican. I hope you were, too. When Pope Francis prayed for peace with Palestinian President Mahmoud Abbas, Israeli President Shimon Peres and Ecumenical Patriarch Bartholomew, they weren’t alone. Millions of Jews, Christians and Muslims around the globe were praying with them. I have faith that Sunday moved us closer to seeing the pope’s prayer answered — even as it posed a challenge: What should we do, every day, to ensure peace comes to pass? I believe there’s only one answer: share our Lord’s compassion with one and all. For more than 85 years, that’s exactly what Catholic Near East Welfare Association has been doing in Palestine, Israel and beyond. To borrow from the pope’s words, CNEWA helps renew hearts and minds. We fund educational, nutritional and health care projects that improve the lives of impoverished Christians and their neighbors. We support the hard-working priests, nuns and lay people who devote their lives to helping the poor. On Sunday, Pope Francis crossed the chasm of religious, political and cultural differences to pursue one goal: peace. At CNEWA, we approach our mission with the same spirit — using Christ’s love to bridge the gulf between people and communities. How do we do it? Through the simple generosity of people like you. Every gift you make to CNEWA, large or small, helps make our world a bit less threatening. A little closer to becoming the peaceful place we want for all. Won’t you join us? Please click here and give what you can. Let’s help our Holy Father and his guests see their prayers — and the hope for peace — find fertile ground at last. "The Blood of Martyrs is the Seed of Christians"
Everyone ran to carry these little ones to St. Louis hospital, the nearest place where the struggling Daughters of Charity and the medical staff treat the wounded to save the lives of these angels caught up in senseless violence that strikes Syria in this fourth year. The emergency room was crammed; some students were transferred to other hospitals. Some of these children will become disabled for life bearing the signs of hatred on their bodies. We continue to lift up in prayer all those who are struggling through this nightmare, especially the very young. Please join me in praying for their safety and their healing. And, if you can, please support them with a gift. Any amount you can offer will give hope in a place of despair and bring consolation to those facing sorrow and fear. You can find out how you can help at this link. On this Feast of St. Joseph the Worker, I pray in a special way that the saint who worked so diligently to bring shelter and protection to the Holy Family will also shelter and protect the most vulnerable and needy in our suffering world. 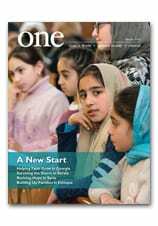 I’m delighted to share with you all this video below, offering a look at our spring edition of CNEWA’s award-winning magazine, ONE. And be sure and check out our special interactive “virtual” version of the magazine online — with all the graphics, photographs and links — right here. "It Is Too Difficult for the Church Life"
Today, I was touched to receive the brief handwritten note pictured above. It comes from Maronite Archbishop Samir Nassar of Damascus. The 4th year of war looks much more violent — it is too difficult for the church life. Thank you for your support and prayer to Our Lady of Peace. He enclosed with the note a list of names: religious who have been kidnapped or killed during the civil war in Syria. With all the hardship his people are experiencing, this good man still took the time to write me a brief note of gratitude — an expression of solidarity and spiritual hope, and a humble request for prayer. As we prepare for Easter during this holy season of Lent, we pray continually that the people of Syria will indeed know a resurrection of their own. We here at CNEWA join our prayers with the archbishop, and those of the whole world, seeking a peaceful end to this tragedy. Won’t you help? Please pray for the archbishop and his people. Ask the intercession of Our Lady of Peace during this prayerful time. And to support our suffering brothers and sisters in Syria, please visit our giving page. Our Winter issue of ONE magazine is now online, and I’m excited to share with you this brief video preview. I think you’ll be inspired by some of the stories in this issue, and gain a new appreciation for the ways we’re able to uplift people in so many places around the world. It’s beautiful work you’re helping to make possible. Thank you!